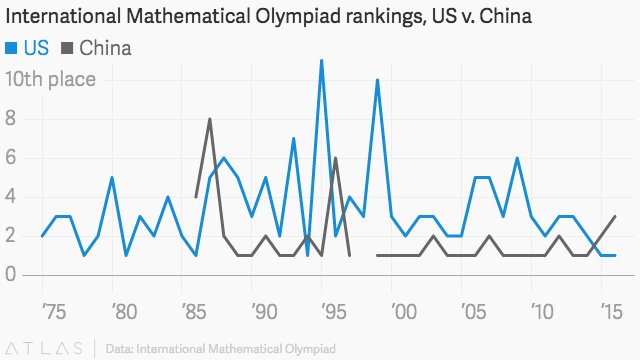 Last summer, a team of American teenagers bucked the stereotype of the country being much worse than others at math by taking home first place in the International Mathematical Olympaid, the world’s most prestigious high school problem-solving competition. It was the first time the US team had brought home the gold since 1994—and the country now seems to be on something of a winning streak. Today (July 14), the six-person US team was announced as the IMO winner for the second year in a row. Team members beat out their competition from other countries, including historically dominant South Korea (second place) and China (third place), by scoring the most points on six problems assigned in 4.5-hour windows during the two-day competition. The second year of success, said the US team coach and Carnegie Mellon professor Po-Shen Loh, “serves as a recognition for the the high standard of mathematical creativity and problem-solving capabilities we have in our country.” He noted last year that the IMO win will hopefully inspire more Americans to “reach farther” in math-related fields. Over 100 countries and regions sent teams to the IMO this year, which took place in Hong Kong. The first IMO ever—back in 1959—comprised seven countries participating in Russia.